1928 and 1934 $500 and $1,000 FRN star notes were replacement notes that the B.E.P. used to replace defective $500 and $1,000 Federal Reserve Notes. These star notes will have a star (*) at the end of the 8-digit serial number instead of a letter. The $500 and $1,000 bills were printed in series 1928, 1934. The 1934A were for the $1,000 stars only. Star notes in this series are extremely rare and in some cases unique. As of Aug 2015, there are 186 $500 stars and 157 $1,000 stars known. Most collectors collect these types of star notes by series and districts. Jhon E Cash has the most extensive census ever assembled on these rare star notes. 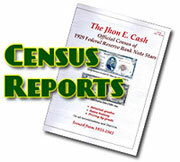 You will soon be able to download the census on this website. Jhon E Cash has a new book due out this year called, "The History and Census of the US $500 and $1,000 Star Notes". You will also be able to download the book ,from this site when completed. 1934 $500 stars with a 1 to 4 back plate number is a non mule star and plate numbers 5-12 are mule star notes. On the 1934A $500 stars all of the are mules notes. On the 1934 $1,000 stars 0 to 4 are non Mules with a 1934 front and a 1934 back plate. If the 1934 $1,000 star has a back plate number of 5 to 8 it is a mule with a 1934 front plate and a 1934A back plate. On the 1934A $1,000 star it is the opposite. If the back plate is 1 to 4 it is a mule with a 1934A front plate and a 1934 plain back plate. If the back plate number is 5 to 8 then it is a non mule with a 1934A front and back plate. As of October of 2017 there are 231 $500 stars and 173 $1,000 stars.